My father, a well known psychotherapist, uses a personality model known as the Interpersonal Check List (ICL). This model is notoriously hard to administer, score, and graph. I developed a program to do all of these things automatically. This is a 128 question test where people mark whether or not adjectives describe them. Thus a person might check yes to “Good Leader” and no to “Hard to Impress.” Once all the appropriate answers are marked, each one is weighed and put into an appropriate bin. The size of each bin marks the prominence of that personality trait in the person. I’ve used this program as my first e-commerce venture. Visit http://www.shawnlankton.com/icl to get information about the program, download the fully-featured demo, or purchase the full program! I finished Tim Ferris’s book, The 4-Hour Work Week. This book is very inspiring, and takes a very different take on entrepreneurship than most books you’ll find on the subject. Tim suggests increasing efficiency in everything you do (both personal and professional) by applying the 80/20 rule and setting deadlines. (The 80/20 rule says that 80% of your results come from 20% of your efforts) When you only do 20% of the things you were doing before, and you set deadlines so you complete them faster than you normally would… efficiency ensues. I attended a talk last night as part of the Georgia Tech Business Plan Competition Workshop Series (pdf). This was such a fantastic talk that I will have trouble putting it succinctly into this post. As with any other person who has been a VC or angel investor, Steve was incredibly sharp, and seemed like he would be impervious to BS either on the giving or receiving end. Steve began his talk discussing the pros and cons of starting a business in the Southeast. He went on a diatribe about how ludicrous the spending in California is. Then he pointed out that although there isn’t much VC investment in Georgia and the surrounding states, there is a better tax situation, and much better access to real estate, talent, and customers. Steve continued by discussing the cyclical relationship between institutional investors, VC’s, and entrepreneurs giving some insight into how that relationship drove VC’s behaviors. Some interesting take-aways were that VC’s want the entrepreneur to get rich, and that they’ll only have to be brutal and cruel if they have to in order to make the returns they promised their investors. After giving some insight in these areas, he began enumerating the things that you must convince investors of when trying to raise capital for a business. Get a good referral (from another investor, an attorney, etc.) If you’re plan comes pre-qualified it. You’re in. Make a 20 page business plan with a 2 page executive summary. No More! In all of these documents, sell the company, not the product. Do your homework on the investors you’re presenting to and tailor the presentation. It will help you and impress them. Choose your investor wisely. Don’t just follow money; find someone that can help you with experience, expertise, contacts, etc. Check out Steve Fleming’s website as well. Here you can find his blog as well as some useful information about starting companies. I just completed this book, The Myths of Innovation, by Scott Berkun after receiving a recommendation (and borrowed copy) from my friend/colleague Jimi Malcolm. Work diligently and tirelessly, but take well-earned breaks to reflect. He belabors the point that innovation comes from persistent effort, not “ah ha” moments. Frame and re-frame the problem you’re working on. By following the same rules and same metrics for success that everyone else follows, you’re doomed to mediocrity. Re-examine the problem and re-frame it. Work really, really, really hard. Finally, here is a video from the “Google Tech Talk” series. I haven’t watched it yet, but I’ll bet you can get the gist of the whole book over the 1 hour video. Last night I finished Hackers and Painters. This book is a collection of essays by Paul Graham, a PhD computer scientist, entrepreneur, and accomplished painter. (All of the essays are also available on his website) He makes a lot of great points about economics, entrepreneurship, design, and society. He also rants ad nauseum about his belief that LISP is the best programming language ever. One of my big take-aways from this book are that to be successful in a tech startup you must work very hard, and make a product that is beautifully designed and loved by users. Furthermore, you must continue working hard and improving constantly or you’ll get squashed by big competitors. If you can do this, then Graham claims success is inevitable. This weekend I finished reading a book that had been on my “to read” list for *years. * This is a book written by my father in 1980 three years before I was born (and again in 2003). The book, Practical Magic, is not about wizardry or any other kind of Harry-Potter magic. It is instead about some fantastic methods and results in doing brief therapy. My take away though, was on how directed attention to people’s communication methods and your own can be very important. The book talks in depth about peoples’ sensory representation systems (auditory, visual, kinesthetic). It then teaches how to learn by looking and listening carefully, which one(s) an individual uses. The observation is then made that by understanding how people are repenting the world to themselves you can relate to them on a much more comfortable and profound level. This is a large part of Neuro Linguistic Programming (NLP). 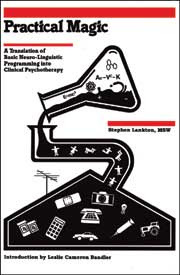 The book’s supposed audience is other therapists wishing to use these NLP ideas in any type of therapy, but I think that anybody reading this book could learn something useful. Just days after finishing it I’m finding myself watching eye movements and body language and listening for linguistic queues to help me understand the ways people are experiencing their world.